The perfect gift for animal lovers! Send your best to new baby AND proud mom with this adorable unisex Safari theme gift set. The versatile canvas tote is packed with cute baby necessities like a blanket, bib, bodysuit, plush animal, socks, and mittens as well as a fun mug and tote bag for mom. A great way to celebrate both of them! The perfect gift for animal lovers! Send your best to new baby AND proud mom with this adorable unisex Safari theme gift set. 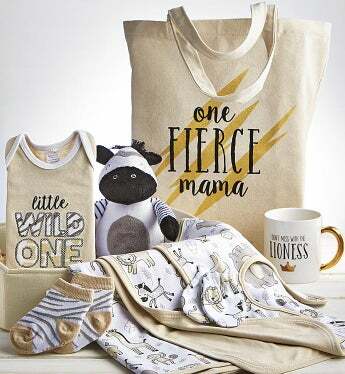 The versatile canvas tote is packed with cute baby necessities like a blanket, bib, bodysuit, plush animal, socks, and mittens as well as a fun "Don't Mess With The Lioness" mug and tote bag for mom. A great way to celebrate both of them!